What is a Consolidation Model? A Consolidation Model is constructed by combining the financial resultsThree Financial StatementsThe three financial statements are the income statement, the balance sheet, and the statement of cash flows. These three core statements are intricately linked to each other and this guide will explain how they all fit together. By following the steps below you'll be able to connect the three statements on your own. of multiple business units into one single model. Typically, the first worksheet of the model is a summary or consolidation view that shows the highest-level figures (monthly and yearly revenuesRevenue StreamsRevenue Streams are the money a business earns from the sale of goods or provision of services. The types of revenue that a business records on its accounts depend on the types of activities carried out by the business. Learn about the different types, how to categorize them and, profits, costsFixed and Variable CostsFixed and variable costs are important in management accounting and financial analysis. Fixed costs do not change with increases/decreases in units of production volume, while variable costs are solely dependent on the volume of units of production. This guide teaches an analyst the fixed vs variable cost methods, productivity rate, etc.) in the form of tables, graphs or charts. Other tabs in the model display financial dataData Sources in Financial ModelingCollecting and using the right data sources in financial modeling is critical to the success of a business. Financial modeling requires gathering and by departments, business units or product lines by years, quarters or months. In this section, we’ll break down the modeling process step by step to explain the details thoroughly. 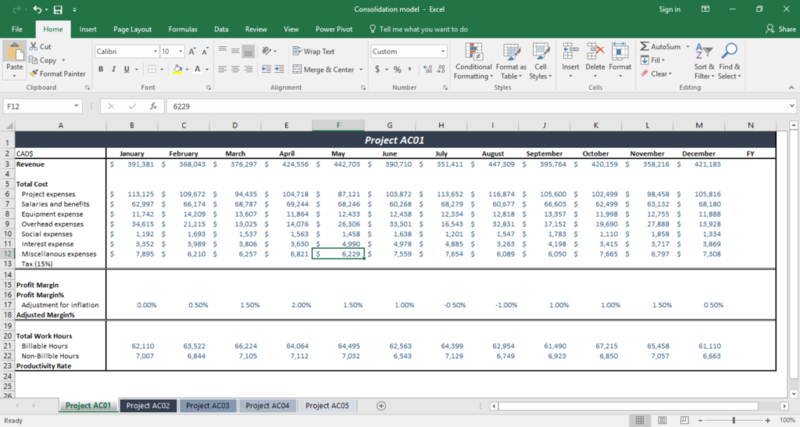 For this sample model, projects are the main “business units” with their own revenues and costs. 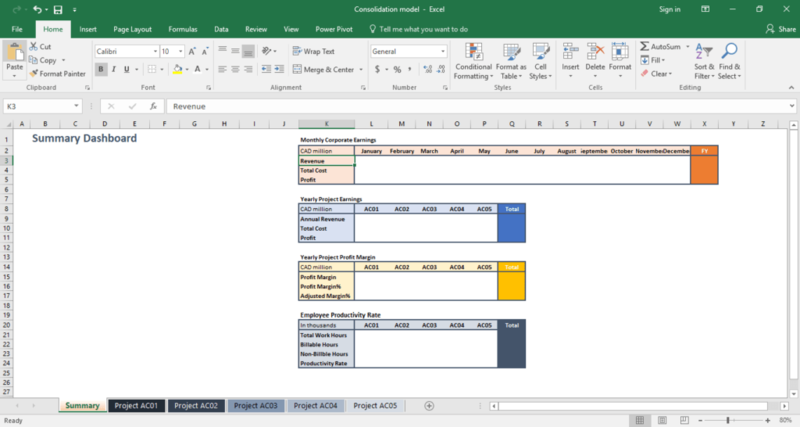 This is a very simple model with only a few inputs, but in the real-world business setting, consolidation models can be quite complicated and involve various data sources and in-depth calculations. The FP&A analystFP&A AnalystBecome an FP&A Analyst at a corporation. We outline the salary, skills, personality, and training you need for FP&A jobs and a successful finance career. 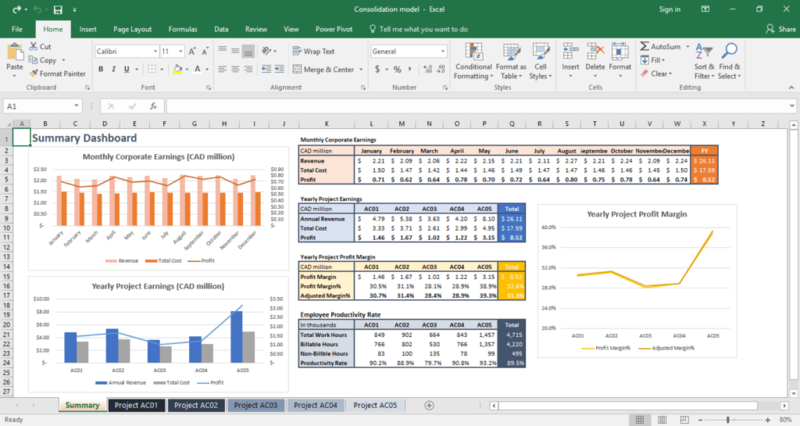 FP&A analysts, managers, and directors are responsible for providing executives with the analysis, information they need to make operational, strategic decisions starts building the consolidation model in Excel by creating multiple workbooks. Each workbook is assigned to a specific project. 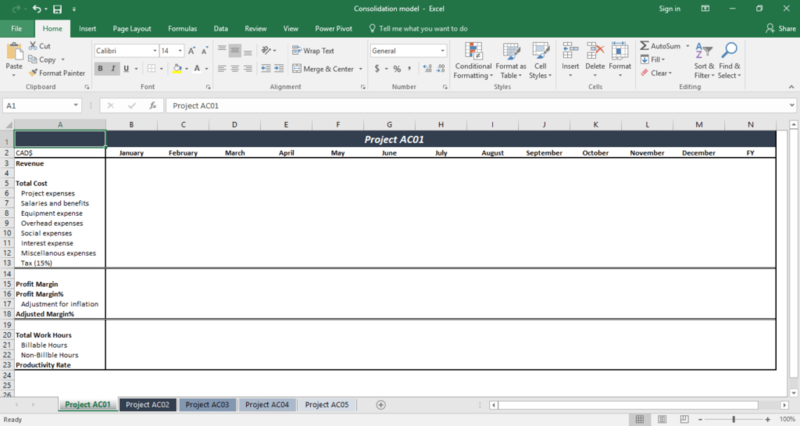 For each project, the FP&A analyst identifies the columns and rows needed. In this model, time (i.e. months) is the main column and the financial metrics (total revenues, total costs, profits, etc.) are the main rows. Starting with the highest-level metrics, the analyst will insert rows for lower-level numbers such as various expenses. Besides the individual months, there is also often a column showing the full year results or the monthly averages. Once all columns and rows are identified, the FP&A analyst inputs the corresponding information collected from financial statements or obtained from developing queries on raw data. They are data that needs to be manually filled into the table, so an analyst should use a different color font (blue color is used in this sample model) to distinguish the numbers from those that will be calculated. With all the desired information in place, the FP&A analyst can calculate metrics that are not readily available from financial statements or other sources. The metrics can be figures such as total costs for each project, profit margins, and productivity rates. Formulas such as SUM, AVERAGE and SUMPRODUCT are commonly used in the calculations. The analyst should always include cell references in their formulas to better track calculation errors. The numbers should be shown in black or other colors to distinguish them from the manually-encoded data. After completing the data tables, the analyst should always validate the data with the numbers in the financial statements to ensure accuracy. This is a very crucial step in building consolidation models that must be completed before proceeding to the last few steps. 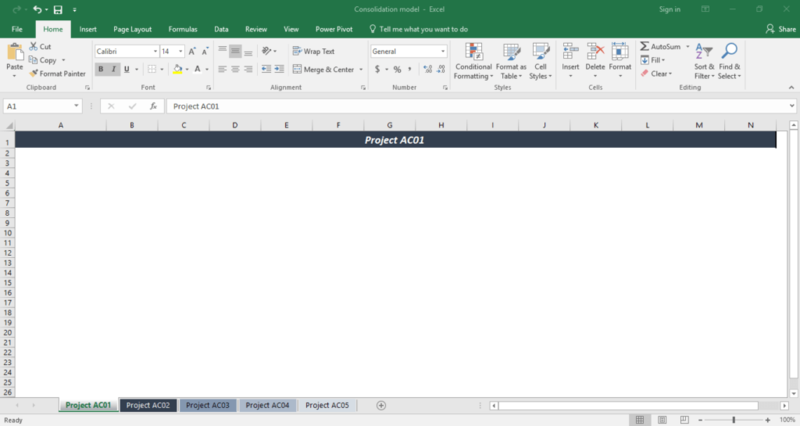 When all individual project analyses are completed, the FP&A analyst creates a summary or consolidation worksheet as the first tab of the model. This is a page to summarize all the project financial metrics and present the highest-level information that is important to managers and corporate decision-makers. Analysts can create tables to display figures like total revenue, total costs, profit margins and margin percentages of the entire business. They can also include information that is helpful to managers to improve operating efficiencies such as the employee productivity rates. Next step is to insert numbers into the summary tables by using formulas. In the formulas, the analyst should always use cell references from individual project tabs instead of simply plugging in the numbers. It is to make sure the right figures are used in the calculations and to allow the analyst to return to and check the reference cells if variances exist. 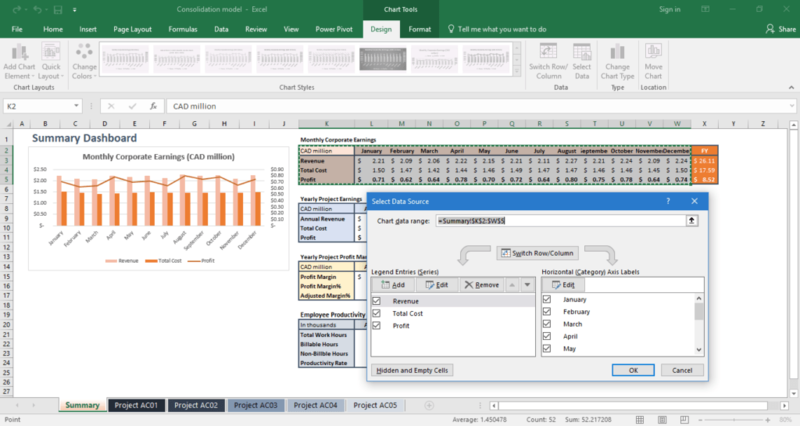 Using the data in the summary tables, the analyst inserts charts and graphs to present information in meaningful and easy-to-interpret formats. There are several types of charts utilized by FP&A analysts to visualize the data, so simply choose the types that would best represent the data characteristics and analytical trends. Lastly, clean up, format and embellish the consolidation model to make it look professional. It is very important because the management team would not want to see an unorganized dashboard that they will find the financial figures difficult to understand.